Marvelous Possibilities: A Pink Witch? What a challenge! I was working at Target yesterday, as a sample lady, and I was chatting with a lady with several Halloween costumes in her hand. She had 2 princesses from Brave and one princess costume from Tangled, and she said the fourth one was going to be a tough one. One granddaughter wanted to be a witch, a pretty pink witch, a scary pink witch, and nothing else. She said she did not sew, and there was no convincing that 4 year old to change her mind. I suggested that a trip to the store with her to pick a costume might be in order. When she sees what they have to choose from she may change her mind. I remember my little sister wanting to be a graham cracker. Or my nephew who wanted to be a scary animal, like a bunny. He dressed as a lion. I was telling her that my grandson, Kol, is having a Halloween costume party, with costumes mandatory, for his first birthday. When I told my husband that we had to find costumes, he said that he thought it was a terrible idea for everyone to come in costume for a one year old. They are often scared enough of strangers, and costumes could be even worse. How many years did my toddlers cry at the sight of clowns, or masks, or the kids trick or treating at the door. Hmmm, grandma needs a costume that's not too scary. Maybe a pink witch! So, with that on my mind, I sat down to make some Halloween cards today. I have not had time to play with my Googly Ghouls stamp set yet. So, I decided to make a pink witch Halloween card. Isn't she cute?? I decided to use the layout from Paper Craft Crew Challenge for my start, and an easel card design to make it even more fun. 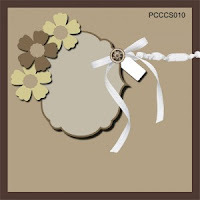 Then I chose my colors from the Challenge at Stampin' Royalty. 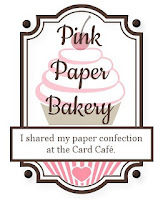 Pink Paper Bakery should be surprised to see a pink Halloween card for their HALLOWEEN theme. I had fun doing this card, especially the glitter, which I have not used in about a year! I thought those pumpkins needed a little frost on them too. I think I'll go back to the traditional colors for some more Halloween fun. Check back tomorrow, to see what I've done. I love your pink witch and spider, Mary Alice! I love your story too! What a cute card, you should get your glitter out more often. 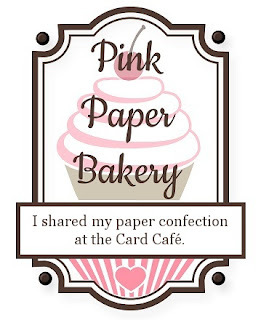 Thanks for sharing with us on Pink Paper Bakery! I hope you follow up with a picture in a few weeks of "grandma in your pink witch outfit" Sparkes were the perfect touch!! !